You will need iTunes 10.6 or later to find this option in preferences. 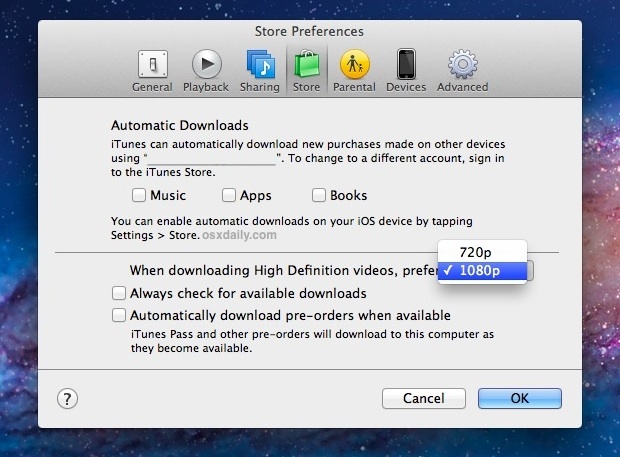 This is the second media compression/quality choice that comes with the new version of iTunes, which also lets users set song bit rate from 128kbps to 256kbps on their iOS devices. This is ridiculously wrong. I have all of these things set to 1080p. I am using my netbook as a downloader for viewing on my ipad, and it is not working at all. It is forcing every download down to 720p. I wish I had gone with android and amazon instead of ipad and itunes.